“We were talking about the old days, and I remembered the weirdest things. Like people calling them ‘friends’. And how they said they were good for your brain. Some families even laid a place for them at dinner. Then I thought about the day it changed. The day Shorefield happened. Joseph had never been good at imagining things, he was good at Maths and Science, not creative things like Art and English. Which is why he didn’t understand why Klaris Cliff was trying to talk to him, why she was trying to get inside his head. Once upon a time imaginary friends were just that, friends. Often to kids who had no one else; but then they became the enemy. Now anyone harbouring a rogue imaginary person in their heads have to undergo a COSH operation, an awful procedure that finds the imagination and shrinks it right down. Klaris Cliff is in trouble and because she is, Joseph is too. If he’s to prove her innocence, and save his and Flea’s imaginations he best act fast. From the first page of this book I was hooked. I needed to know why people hated kids’ imaginary friends, why they became the enemy and how Joseph and the Cliff family were going to react to the things happening around them. Who Framed Klaris Cliff? is clever and intriguing and I was desperate to turn the page each time I got to a new one. The story is odd. I have a habit of glancing over blurbs, seeing what publishers and other people say about the book and not really taking in what its about. I think reading is more fun that way, so when I began reading Klaris Cliff I had no idea about these imaginary people, I just thought it was a modern day story about a kid and his friend Klaris. What I got was incredible and it really blew my mind, a story about imaginary people coming almost lifelike, shaping the world and making it a darker place, a story about an imaginary person who has done nothing wrong but who people hate because of what they believe other imaginary people have done. I loved the story from start to end and I particularly loved the end. The book is told in first person, from Joseph’s point of view all the way through. I loved this about it but in places I thought the writing was a little simplified for a YA book. I think this works though as the book would be perfect for younger teens to read in classrooms and will definitely pique the interest of a lot of them, including reluctant readers. I would say for an advanced reader they will probably think the writing is basic and in places I thought it was almost middle grade but due to its content I would be reluctant to give it to anyone under 12. The story is powerful though and I doubt the writing would put off those more advanced. The characters were a bit odd but I liked their oddness and it worked well for the story. I enjoyed the budding friendship between Joseph and Flea and I think Flea was possibly my favourite character of the book. I liked the unconventional nicknames the Cliff children had and how close the two families seemed to be. I also liked the relationship that Joseph had with his dad, even though he tried to distance himself from his dad in some ways, thats just a part of growing up. I was literally on the end of my seat, dying to know what was going to happen towards the end of this book and I really do believe anyone else reading it would be too. It was all set to be a five out of five book for me until one paragraph ruined that illusion for me. I was already aware that there were only three (and a half if you count Joseph’s absent mother) female characters in this book. I was ready to over look that until the stereotype came out about a girl being good at rowing ‘for a girl’ and then the narrator, Joseph, taking that opportunity to say how he must go home and get on his weights as she was probably stronger than him. I really didn’t enjoy that paragraph, it tripped me up and I honestly am probably being quite pedantic but I wouldn’t be reviewing honestly if I let it slide. I know that the author probably thought that something like this would make it a more authentic male teen voice but I didn’t, by this point I had been reading Joseph’s narration for over 200 pages and I really didn’t think it was something he would say. It seemed like something Rocky would say, or one of the losers from the village earlier in the book but not Joseph and it threw me off. Of course he didn’t say it out loud, it was just narration but still… I didn’t think it fit right. But thats just my opinion as a reader. Anyway, other than this I actually adored Klaris Cliff and I will still be on the lookout for more from this author. The book reminded me of the kind of things that my english teacher would have liked us to read and I honestly do think it would be a great addition to a younger high school syllabus or a school library. 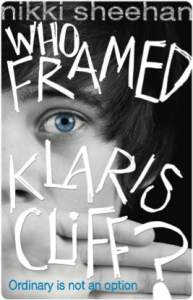 Who Framed Klaris Cliff will be published on 6th Feb by Oxford University Press. My copy was sent from the publisher in exchange for an honest review. I’ve seen a couple of positive reviews like yours for this and I’m really excited to try it – sounds so unique 🙂 Great review!